War was fought for several reasons throughout history. Blood was spattered, kingdoms were destroyed, and people were slaughtered. Some battles played a significant role in history and are memorable. Some battles created new legends that were appreciated for many generations. Some of the efficient military tactics that originated on the ancient battlefields are still followed today. Ancient military commanders like Alexander the Great, Hannibal proved with their brilliant strategies that nothing was impossible on the battlefield. In the summer of 479 BC, the large Persian force lead by King Xerxes invaded Greece. The Greeks tried to hold the Persian force with 300 Spartiates and 7000 hoplites under the leadership of King Leonidas in a narrow pass. Despite of gallant efforts of Spartan, Persia conquered the Thermopylae and had several victories in Artemisium, Thessaly, Boeotia, Euboea, and Attica. However, they lost the Battle of Salamis. Then Xerxes retreated and returned to Asia with half of his army. He put Mardonius in charge in Boeotia. 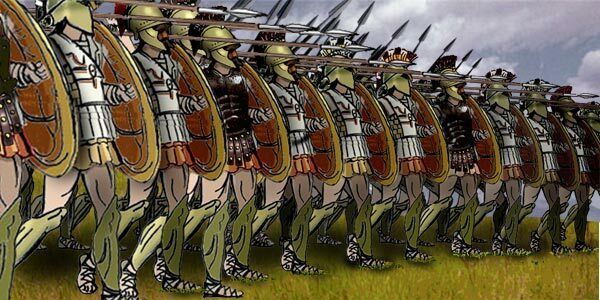 The 60,000 hoplites, under the command of Spartan’s King Pausanius, marched towards Boeotia to seek battle with the Persians. 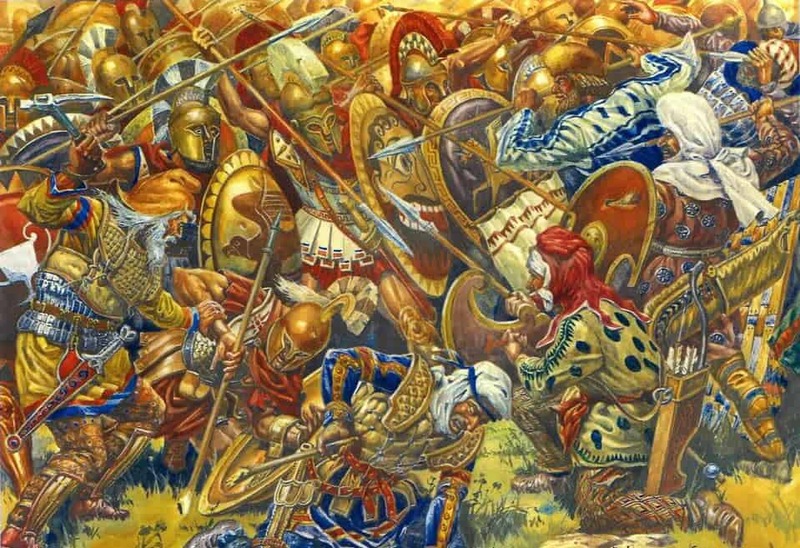 The Historic battle took place near Plataea (modern Plataiai) in Boeotia. A huge portion of the Persian army was trapped in the camp and slaughtered. This battle allegedly happened on the same day at the Battle of Mycale and marked the end the invasion started by the Persians. In the summer of 480 BC, an unparalleled Greek force of 7,000 men, led by King Leonidas of Sparta, blocked the outnumbered Persian army at the pass. The Greeks held off the Persians for 7 days with 3 vicious battles, often epitomized as famous last-stand battles in history. Leonidas blocked the road with his force for 2 days; this road being the one and only way for the Persian army to pass. After the continuous two-day battle, Greek resident Ephiatles revealed the secret pass, where the Persian army could enter. Leonidas with his 300 Spartans, and several other Thespians and Thebans died of a glorious death at the pass. The Han dynasty ruled China for around four centuries, dividing the kingdom into its Western and Eastern Period. A decisive battle took place in 208 A.D between the two southern warlords, Liu Bei and Sun Quan, and Cao Cao, who had control over the northern part of China. Cao Cao assembled his 800,000 soldiers and attacked his southern rivals swiftly with a mission to unify China. Southern warlords had altogether 50,000 soldiers, including 30,000 trained naval soldiers led by Zhou. 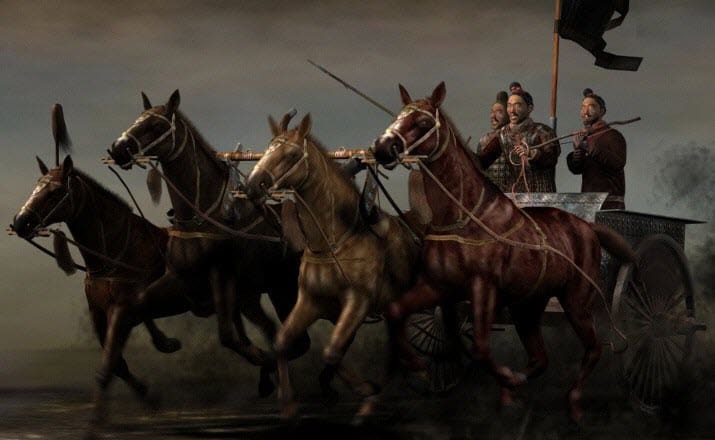 Despite of the low numbers of soldiers, Zhou Yu and Lu Su were able to analyze the disadvantage of Cao’s army. The biggest disadvantage Cao Cao faced was the lack of unstable rear supply, and the fact that many of the soldiers were inexperience in water battles. 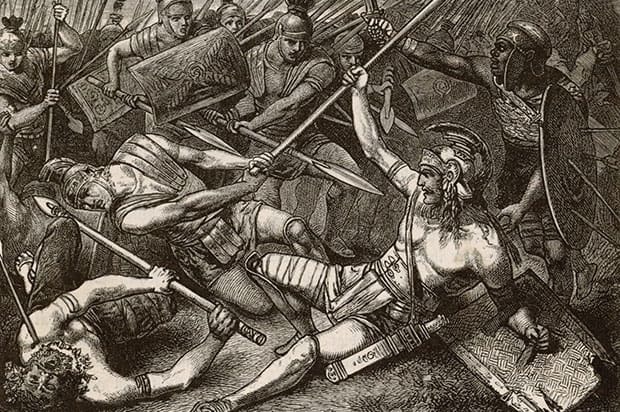 Often considered one of the costliest battles of Alexander The Great, the Battle of the Hydaspes River was fought between King Porus of the Hindu Paurava kingdom and Alexander The Great in 315 BC. 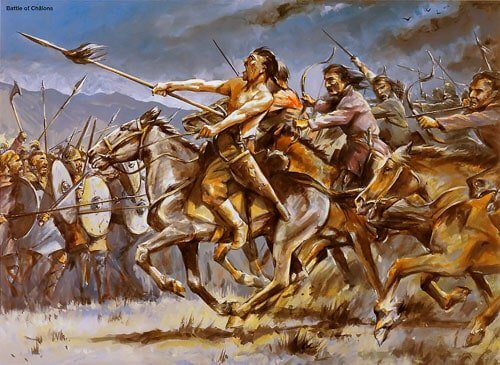 During this battle Alexander attempted to cross the river during a monsoon, despite the great Indian force waiting for him in the opposite side. The battle was the result of Alexander’s mission to extend his empire towards India. The battle opened a gateway to develop the Greek and Indian cultures that lasted throughout many centuries. The Battle of Changping took place during the Warring States period in China between the State of Qin and Sate of Zhao. Qin won the decisive victory. Qin attempted to invade Zhao in 262 BC but was forced back. 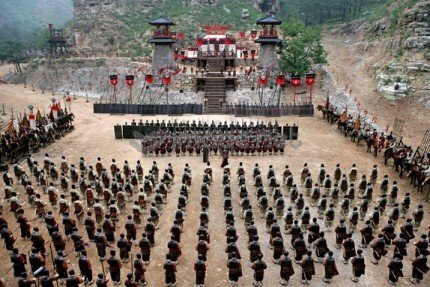 Zhao, with his 400,000-man force attacked the Qin camp. 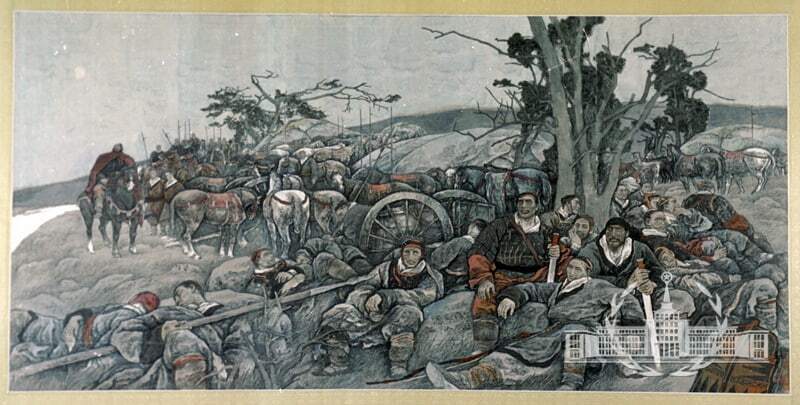 However, before reaching the camp, Qin’s army ambushed the Zhao force in the mountains. After 46 days without the supplies Zhao finally surrendered. The Battle of Chalons was the part of Hunnic Invasions of Gaul, fought between the Roman Emperor Aurelian and Emperor Tetricus I of the Gallic Empire.This battle was remembered for years because of the high death toll. The battle ended the Gallic Empire and reunified it with the Roman Empire after 13 years of separation. The Battle of Kadesh is the oldest ever recorded military battle in history in which the details of formations and tactics are known. The battle took place in present day Syria between the Egyptians (Ramses II) and Hittite Empire (Muwatali II). Ramses, along with his bodyguard, arrived from the north to join the Amun division and to set up a fortified camp to await the Ra division, who were marching from the North. They captured two hittie spies who, after being tortured, revealed the true location of Muwatali’s army. After learning the location, Ramses summoned the remainder of the army and planned to attack the Ra division. 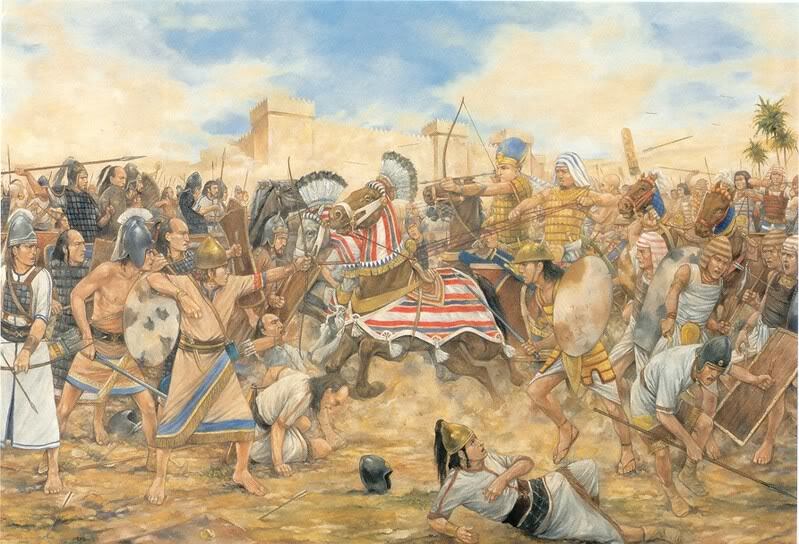 When Muwatali saw an approaching army, he sent his chariot force south of Kadesh to attack the approaching Ra division army. Siege of Syracuse is a part of the second Punic war that took place in 214-212 BC. Sicily was fragmentally divided into two rulers. The Romans controlled the west and north, while Hiero controlled the remainder. After the death of Hiero, his young grandson Hieronymus succeeded him. He started negotiating with Hannibal, which did not turn out well for him. Hieronymus was assassinated and Syracuse was declared a democratic republic primarily dominated by Carthaginian. The assassination of Hieronymus led to a conflict between pro-Carthaginian and pro-Roman factions. The two brothers, Hippocrates and Epicydes, of mixed Syracusan and Carthaginian descent, took control of the city with a hope to make a Sicily Carthaginian stronghold. In order to deal with the situation, the Romans sent Marcus Claudius Marcellus to Sicily, who took control of the Leontini and took all the Carthaginians prisoner – beating and beheaded them. The two brothers escaped from the Leontini and spread the story to the Romans. The Romans slaughtered all the inhabitants of the city. Marcellus encircled Syracuse and commenced the military operation in 213 BC. The Battle of Metaurus was one of the most important battles of the second Punic war. Hannibal was waiting for reinforcements and seized equipment from his brother Hasdruda. The reinforcements and equipment were pivotal for victorious battle against Rome. The Roman force was led by Marcus Livius Salinator and Caius Claudius Nero. Claudius, who fought Hannibal in Grumentum, 100 km south of the Metaurus river, reached Metaurus to accompany Marcus Livus. The vicious and undetected forces trapped Hasdrubal in Metaurus. Instead of the expected military troops, Hannibal received Hasdrubal’s head thrown by the Roman into his camp. Third Servile War was the last in a series of slave rebellions against the Roman Republic, lead by the rebellious Roman slave Spartacus. The small group of 78 slaves and escaped gladiators grew into a massive army consisting of 120,000 men, women, and children. With the growing alert from the slave rebellions, the Romans formed an army of eight legions under the leadership of Marcus Licinius Crassus. The war ended in 71 BC with the decisive Roman victory. The decisive battle between Alexendar the Great and the Persian Achamenid Empire took place on October 1, 331 BC. Despite his small military force (compared to the Achaemenid Empire), Alexender’s tactics worked effectively. The two great armies met near Gaugamela (the present day city of Mosul in Iraq). Alexander’s ingenious tactics worked so effectively that the battle led to the fall of the Achaemenid Empire. Battle of Salamis is part of the Greco-Persian wars, fought between the Alliance of Greek city-states and the Persian Empire in 480 BC. Despite being heavily outnumbered by Persian soldiers, the tactics of the Greeks outmaneuvered their enemy in the narrow streets. A small Greek force blocked the Thermopylaes pass. Athenians engaged with the Persian force in the nearby straits of Artemisium, resulting the Battle of Thermopylae. Greek forces were heavily obliterated. King Xerxes, releasing his forthcoming defeat, moved with his few armies back to Persia. Persian General Mardonius took charge of the battle with a huge force. Often taken as first ever recorded naval battle, the Battle of Salamis ended up with a Greek victory. The Persians faced heavy losses, losing 300 ships as opposed to the Greek’s loss of 40 ships. Crassus, one of the wealthiest men in Rome, assembled his forces and decided to invade Parthia without the official consent of the Roman Senate. Crassus marched into Parthia through the deserts of Mesopotamia, rejecting an offer from King Artavasdes II of Armenia to use the Armenian route for the invasion. The destructive clash between the two empires took place near Carrhae. Surena decisively won the battle, slaughtering and capturing most of the Roman Soldiers. Crassus was killed in the battle, which led to the end of the Roman Republic and the rise of Roman Empire. The decisive battle of Chu Han Contention, fought in 202 BC between Liu Bang and Xiang Yu ended with the victory of Liu Bang. Liu Bang later proclaimed himself the Emperor of China and founded the Han Dynasty, whereas Xiang Yu committed suicide after the battle. During the battle, Han troops captured Xiang Yu’s wife “Consort Yu”. Yu sent most of his army to the capital to save his wife, and the divided force turned out to be an advantage to the Han. Liu Bang snared Xiang Yu’s 100,000 armies with his prodigious 300,000 forces at night, as the battle continued. When Xiang Yu saw his army crumbling by a large margin, he had no choice but to kill himself with a sword. All of these ancient battles created big political and geographical change. Huge numbers of people were killed, and yet the battles continued. Some wars were the result of a conflict that could have been resolved with various other methods. Oftentimes war was used to show the kingdom or county’s supremacy, and it often caused the loss of innocent life. Tha Battle of Salamis in 480 BC (#3) had nothing to do with the Roman Republic and Parthian Empire (neither yet existed) and the titles saying so must be an editing mistake because the description has it right: it was between the allied Greeks, predominantly Athens, since she had to only great Navy, and the Persian Empire. Why did u forget the great indian battle of mahabharata between kauravas and pandavas where 16000000 lives died? These battles are historical. The Mahabarata is a made up religious text. What about one of the greatest battle of yarmouk between the Byzantine Empire and the Muslim Arab forces of Rashiudin Caliphate. One of the most decisive battles in military history was The Battle of the Teutoburg Forest which took place in the Teutoburg Forest in 9 CE, when an alliance of Germanic tribes ambushed and decisively destroyed three Roman legions and their auxiliaries, led by Publius Quinctilius Varus. The anti-Roman alliance was led by Arminius, a Germanic officer of Varus’ auxilia who had acquired Roman citizenship and had received a Roman military education, thus enabling him to deceive the Roman commander methodically and anticipate the Roman army’s tactical responses. This battle only lasted 2-3 days – it was THAT decisive. The three Roman Legions that were destroyed represented 1/10 of the entire Roman army and brought to a halt the expansion of Latin civilization into northern Europe, which changed the course of world history quite dramatically. 5000 years ago earth population was well below 100 million. So please consider numbers in Mahabarath wars again. The article/blog is not very helpful. For one thing, the author doesn’t define what is a decisive battle. Are we talking about a battle that changes the course of history? In that case Zama is a decisive battle and Cannae is not. Kadesh is not a decisive battle in any understanding and certainly not strategically. Battle of the Metaurus is an important Roman victory in the Punic Wars but I don’t think it rises to being a decisive battle. Had the Romans lost the battle they would have likely hunkered down as they had in the past. The Servile War doesn’t even qualify as a battle so I don’t know what it is doing in the list. Carrahae changed nothing between Parthia and Rome. Even had Crassus been successful later victories by Trajan showed that holding Mesopotamia was beyond Rome’s strategic resources. Overall, not an impressive list.